So you’ve briefed your new designer, you have your brand guidelines, there’s nothing standing between you and the deadline. Or is there? “Can you send me your logo?” the designer asks. You send him the one you’ve got in your email signature. “That’s low resolution – I’ll need to redraw it” the designer responds. Do they, though? You’ve probably got exactly the file they are looking for, but which logo file will do which job? 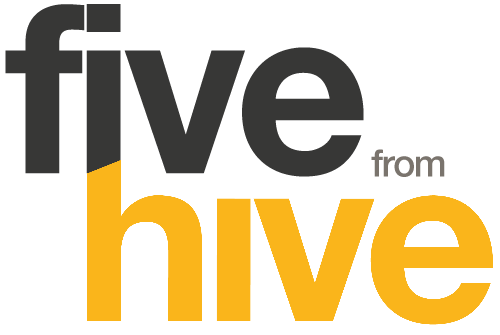 Here’s Five from Hive to help you out! There are two main categories of graphic file: bitmap or vector. Bitmaps are a cluster of pixels that create a fixed representation of your picture. It’s this fixed nature that can cause issues with resolution when you are placing it in different projects. Vector files work by listing instructions to your software to draw lines between two points. They are scaleable to any size so resolution is not a problem – but they are not as easily used by some programs. So let’s get down to detail! Which file type should you use for different occasions? Probably the most common bitmap file format used in marketing media. Good for high resolution photography, but also good for images where colour gradients or photographic elements are required for the web. They don’t have transparent backgrounds so that can cause an issue for logos on the internet, and if the original file doesn’t have enough resolution to get the size you want the image will start to look pixellated or jagged on the edges. Best used for web images or email marketing, a GIF file is limited to a colour palette of 256 tones and is not great for images with gradient colours or textures. They are good for solid colours, text, and can support transparency which is good if your image needs to sit on top of a coloured or textured background. They can also be simply animated too. PNG files have the “best of both worlds” in bitmap terms – they don’t have the colour limitations of a GIF, but can also support transparency. It is primarily used for the internet rather than printing, but the PNG is also the favoured file format to import into Microsoft Office documents. Again, as a bitmap image it can start to pixellate if it is not a high-enough resolution to begin with. This vector format is the industry standard for printing logos and similar at any size without loss of quality. Supports transparency, and also allows for spot colours too if you have any Pantone colours used as part of your branding. Designers are also able to open and amend the files easier too so they’ll be very happy to receive them! An .EPS file might also contain bitmapped images inside it, but the same rules will apply regarding resolution of bitmaps if they do. Most commonly used for saving whole multi-page documents, this file format can also be used to supply a combination of vector and bitmap resources. This can be a useful backup in the absence of an EPS, and Microsoft Office will also let you place these files into your document as a graphic. Of course, if this is all still gobbledegook to you then your design/marketing company will generally give you the right file for the job if you just explain to them what you plan to do with it! If they can’t, or you don’t HAVE a design/marketing company, then our door is always open (unless it’s really cold, in which case we’re not fond of the draught. However, we’ll always answer it if you knock!). Give us a call on 01908 521269.